This spicy peach bourbon smash cocktail is a delicious summer bourbon cocktail made with fresh peaches and smashed jalapeños. Sweetened with jalapeño infused honey, this peach whiskey drink goes down smooth and ends with a kick of heat. Summer isn’t complete with out a peach whiskey drink. For more summer cocktails be sure to try rhubarb basil smash, strawberry rhubarb margarita, and my collection of easy gin cocktails. In a cocktail shaker, smash a slice of peach and one to three slices of jalapeno pepper with a heavy drizzle of jalapeno infused honey. I make my own jalapeno infused honey using a sous vide technique. Follow this link to learn how to infuse your own honey. Fill the shaker 1/2 way with ice and add the 1 1/2 ounces Peach Schnapps, 3 ounces Peach Whiskey and shake. Shake to make sure the honey is diluted and infused into the cocktail. In a rocks glass, filled with ice, add a few more slices of jalapeno for garnish along with a slice of fresh peach. Strain the peach bourbon smash cocktail over the ice. This spicy peach bourbon smash cocktail is a delicious summer bourbon cocktail made with fresh peaches and smashed jalapeños. Sweetened with jalapeño infused honey, this peach whiskey drink goes down smooth and ends with a kick of heat. 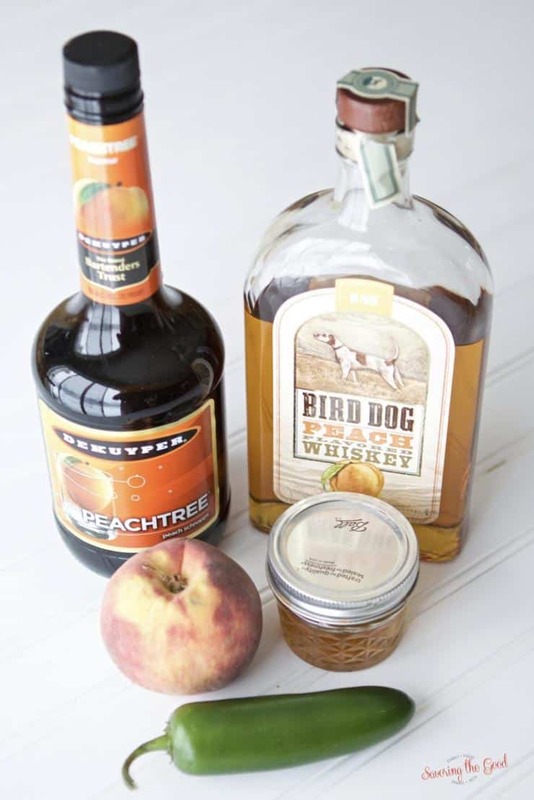 Summer isn't complete with out a peach whiskey drink.